In the last few years, it’s fair to say that I have been an honored guest at a number of weddings. Some have been large gatherings, some small intimate affairs. Some have been traditional and others quite modern. No matter what the theme of the wedding, the time of year it took place, and the types of traditions encompassed within the event, all have been special and beautiful in their own right. One interesting component that I like to observe during weddings is the integration of wine. Considering many of my friends are “foodies” or work in the wine industry, it’s not surprising that I’ve experienced a number of weddings where wine took on a central focus. Beyond the obvious in which the wedding was hosted at a winery, wine selections can be personal for the bride and groom. I have seen wine added as favors for attending guests, some specifically produced by the bride or groom, used for toasts (naturally), hand selected by the bride and groom for the reception, and integrated as a key element during the ceremony itself. If you are currently planning your wedding or a social event, these next few blog posts offer some unique and creative considerations in which wine can play a role in your special day. As always, if you are currently looking for help on choosing wines for your big day, please inquire at info@dgwinemaking.com today! Many couples may decide to incorporate wine into their actual ceremony, and there are a few unique ways to do this. One wedding I attended included a wine ceremony in which the bride and groom each had a wine that they poured into a decanter. One wine was white and the other was red, and when they were mixed in the decanter, a pink wine emerged. Then, after a blessing over the wine and the marriage, the couple tasted their blended wine together. The mixing of two wines is similar to sand ceremonies in which the two getting married pour two different colors of sand into one container for a blended design or color. This tradition represents the blending of two families coming together in the couple’s union. Many religious or traditional weddings also include a blessing over wine for the newlyweds. If you have the option to select a wine, now is a great time to pick something special. For Jewish weddings, the wine may play a central part of the ceremony itself. Many Jewish couples tend to select Kosher wines for their ceremony although some less traditional couples opt for a non-Kosher wine. If selecting a Kosher wine, I’d encourage Jewish couples to explore Kosher wines before selecting one for their big day. There are a lot of unknown Kosher brands currently imported into the U.S. from Israel and some of them are rather delicious. One of my favorite brands is Galil Mountain, and while it can be a bit pricy ($30-$40 range), it’s worth having something special for the ceremony that is enjoyable by the couple. 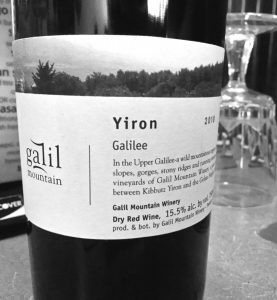 Personally, I love the Yiron Cabernet Sauvignon blend by Galil Mountain as the wine bursts with fruit flavors: plum, cherry, and blackberry. Finally, using a wine that has special meaning to the couple during a wedding blessing can also be very meaningful. For example, my husband and I selected our memory wine to be used during our wedding ceremony. My definition of a memory wine is any wine that captures a very strong emotional memory or attachment to an individual. This memory wine, the Black Ankle Vineyards 2010 Rolling Hills red blend was the first wine that my husband and I ever shared together. One key objective for my wedding was to use local wines as a way to support the local agricultural and wine community. 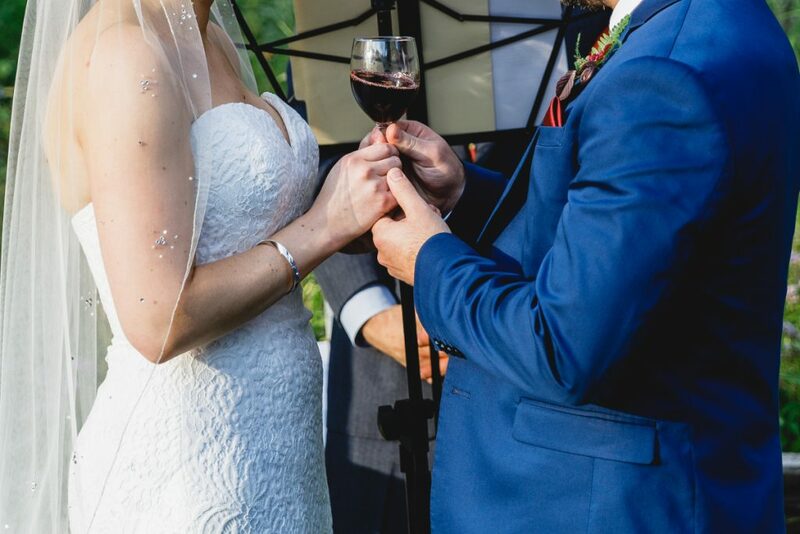 I loved the fact that we were able to use a local wine for our ceremony and that Black Ankle Vineyards is well-known for its concentrated red blends. Additionally, we were lucky enough to get the original 2010 vintage year that we shared together for our wedding ceremony. For couples that maintain a cellar, or enjoy aging wines, choosing a specific year’s vintage may be a fun addition to your ceremony. Or, if your wedding is late enough in the season, you can also opt for your wedding year’s vintage. This has been a fun integration of wine in weddings that I have noticed over the years. 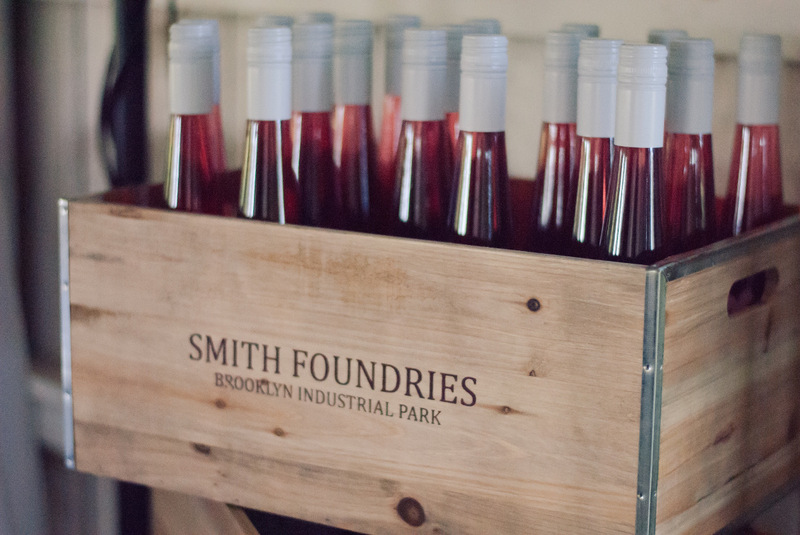 One of my most favorite uses of wine favors was when a winemaker created and bottled a rosé wine specifically for wedding guests. 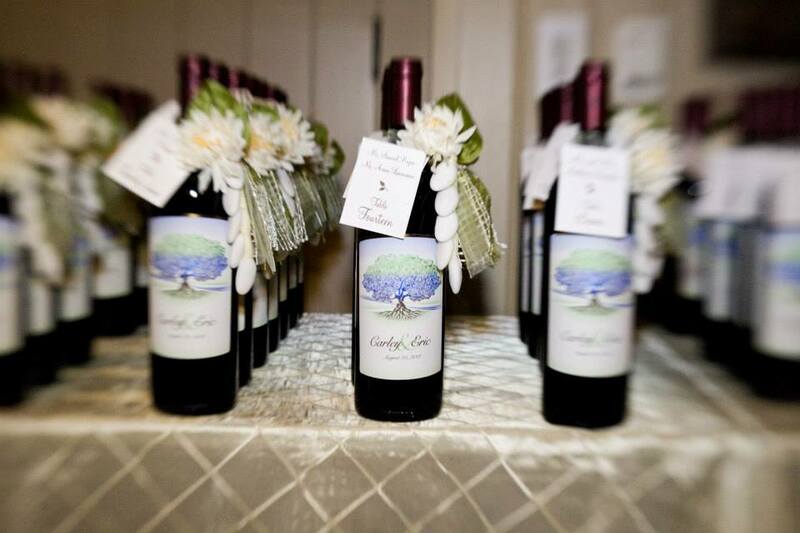 Wines were packaged in smaller, 375-mL bottles, and a special label was created in honor of the wedding day. If you aren’t a winemaker, consider exploring your local wineries for custom label options on some of their premier wines. Some wineries may provide you with a list of wines available for custom labeling that can be used as your wedding favors. Be warned that not all wineries can offer customized labeling for various reasons. 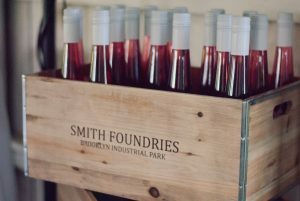 In contrast, other wineries may offer smaller-serving sized bottles that provide flexibility in creating unique wedding favors. Keep in mind that it can be fun to explore a winery that is close to your home, future home, wedding location, or has special meaning for the newlyweds. In future blog posts, I’ll explore the use of wines as décor and guest books. The guest book idea is fun because it can be used for weddings or at any celebratory event. 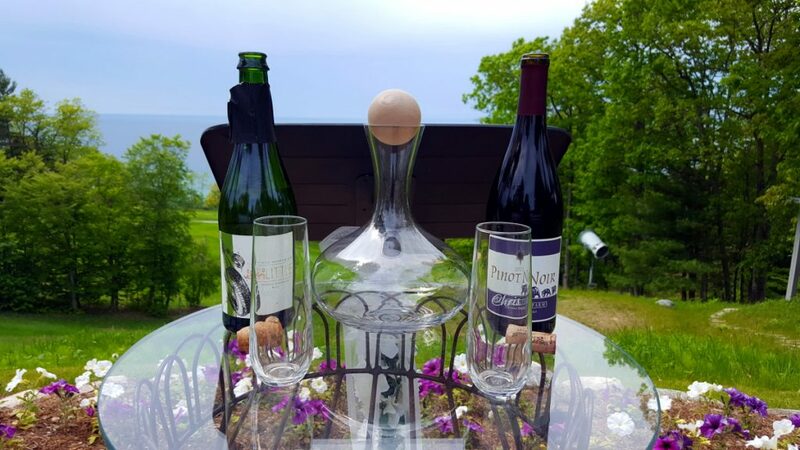 I’ll also divulge into the local wine selections for my wedding: what wines I picked, why I picked them, and how the wines were received by guests. Plus, I’ll reveal some useful secrets when it comes to picking your own wines for the toast or reception. 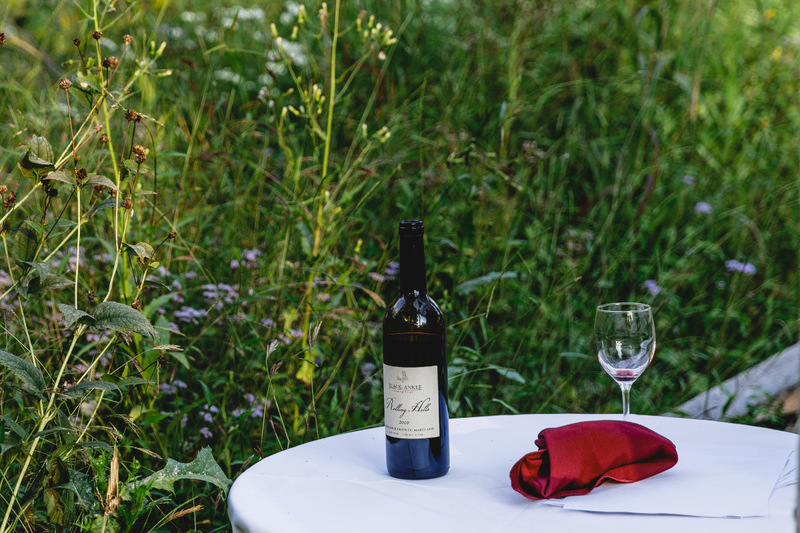 If you are currently planning a rehearsal dinner or your own wedding reception and are required to bring the wine, please consider my consultation for help. Inquire at info@dgwinemaking.com. As a general note, I do not work specifically for any particular winery, and am an independent consultant. Therefore, I can help you make selections based off of a vendor’s/restaurant’s wine list, local choices that may not be well-known brands, related to a wedding/event theme, or general brands that are of particular value.